View the threads williamca has started. Leave feedback for williamca or read feedback left by other members. View the member feedback williamca has written of others. 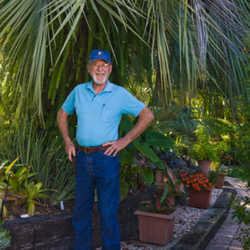 "In 25 years we have created a mixed tropical garden mostly containing bromeliads, gingers, bamboo, grasses, cycads, begonias, crotons and woody ornamentals. We welcome visitors, have plants and cuttings to give away and nothing for sale." "Image taken by Jerry Pavia, well-known photographer whose pictures are published in numerous gardening books. This Plant City, FL garden is 25 years old and is a mixed tropical and native plant garden with extensive planting of bromeliads. Visitors are welcome and cuttings, seeds and plants are free."